An urban oasis surrounded by ocean and mountains- Victoria, British Columbia will have you spoil for choice with the many fun things to do and beautiful places to explore. The possibilities can seem endless! There is always something to do in Victoria, British Columbia. An urban oasis surrounded by ocean waters and mountainous wilderness, the city offers the best of both worlds. Residents and visitors alike can enjoy the restaurants, beautiful shops, museums and city parks complemented by world-class golf courses, hiking trails, and fishing expeditions. What’s so amazing about having such a variety of options in such close proximity is the very rare opportunity to have a number different experiences in a single day – golf in the morning, skiing in the afternoon, a walk through the Butchart Gardens followed by an evening at the symphony. The possibilities can seem endless! British Columbia’s provincial Museum is situated midway between the Parliament Buildings and the world famous Fairmont Empress Hotel. It is by far the best museum of natural history and culture in Canada. Walk through a rainforest, view animals on West Coast beaches and in tidal wetlands, sit among the aboriginal memorial mountains, and learn about the First Nations people’s struggles after European settlement. Other interactive features include an exact replica of the HMS discovery – the ship that brought Captain Vancouver to these shores, and a street of shops in old town. Outside the museum, is the Thunderbird Park, home to a traditionally carved memorial and house poles. Nearby, the small mid-19th-century Helmcken House is the oldest residence in British Columbia still standing at its original site, the house once belonged to J.S Helmcken, a practicing local doctor, and politician. He is most known for campaigning vigorously for the then British colony of Victoria, and British Columbia to join the newly establishment confederation of Canada. 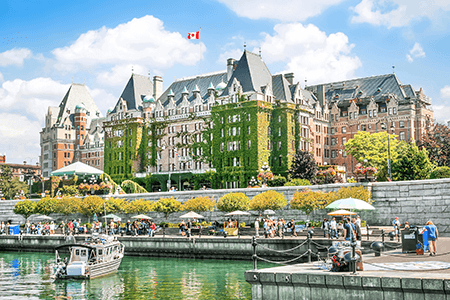 Built in 1908 for the Canadian pacific, like the Chateau Frontenac in Quebec, the Fairmont Empress Hotel on the Inner Harbour is one of Victoria’s best-loved landmarks. The Architect Francis M. Rattenbury was responsible for the designing the Empress, entering the vast lobby of this iconic hotel is like walking back in time to before the First World War. Afternoon tea served with great style is an experience for any visitor. An extension on the north side of the Empress Hotel houses a collection of several dozen scenes in miniature at Miniature World. The models of historical events, castles, and dollhouses captivate the young and old alike. Victoria’s Craigdarroch Castle is a fairy-tale mansion, and widely considered a gem of Victorian architecture. Scottish immigrant and entrepreneur Robert Dunsmuir commissioned the home for his wife in the 1880s. Dunsmuir made his fortune in coal mining but died before the mansion was completed. The mansion is located in a particularly affluent area of Victoria. The elegant Rockland centers on Rockland Avenue, which is lined with grand heritage homes including Government House – the official residence of Her Majesty’s representative in British Columbia. The house itself is closed to the public but the immaculate gardens are a delight for everyone. Surrounding the Bastion Square is the principal thoroughfares of Victoria’s Old Town – Wharf Street, Government Street, and Douglass Street, running north-south, and Johnson Street, Yates Street, and Fort Street crossing them. A lovely area to stroll, Old Town boasts some historic buildings and old-fashioned shops such as Rodger’s Chocolate and the tobacconist E.A Morris. The gun batteries at Fort Rodd Hill National Historic Site, about 13 kilometers west of Victoria, used to guard the sheltered waters of Esquimalt Harbour, once a British Naval Base. The guns were in service from 1895 to 1956. Today, the well-preserved fortress can be visited. Nearby the Fisgard Lighthouse was the first on the west coast of Canada and is now a definitive landmark. One of British Columbia’s premier tourist attractions is the magical Butchart Gardens at Brentwood Bay on the Saanich Peninsula. Here in 1904, the wife of a prominent businessman in Canada Jennie Butchart started to lay out a fragrant garden in abandoned limestone workings. 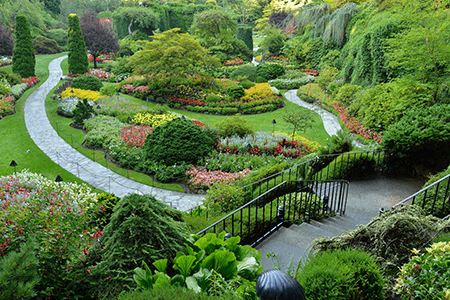 Flourishing, not least because of the mild climate, the gardens have since been developed into a 20-hectare horticulture tour de force that is unrivaled in Canada. The Italian garden, rose garden, Japanese garden, and sunken gardens are among the loveliest. Open spaces among pools, fountains, and the many exotic plants are used for artistic and musical performances. The Hartley Park National Historic Site consists of a castle built in 1908 by former British Columbia Premier and coal baron, James Dunsmuir, and an Edwardian estate, with Japanese, Italian, and Rose gardens. Visitors can choose to walk through the gardens or take a guided tour of the castle – now a base for the Royal Roads University.